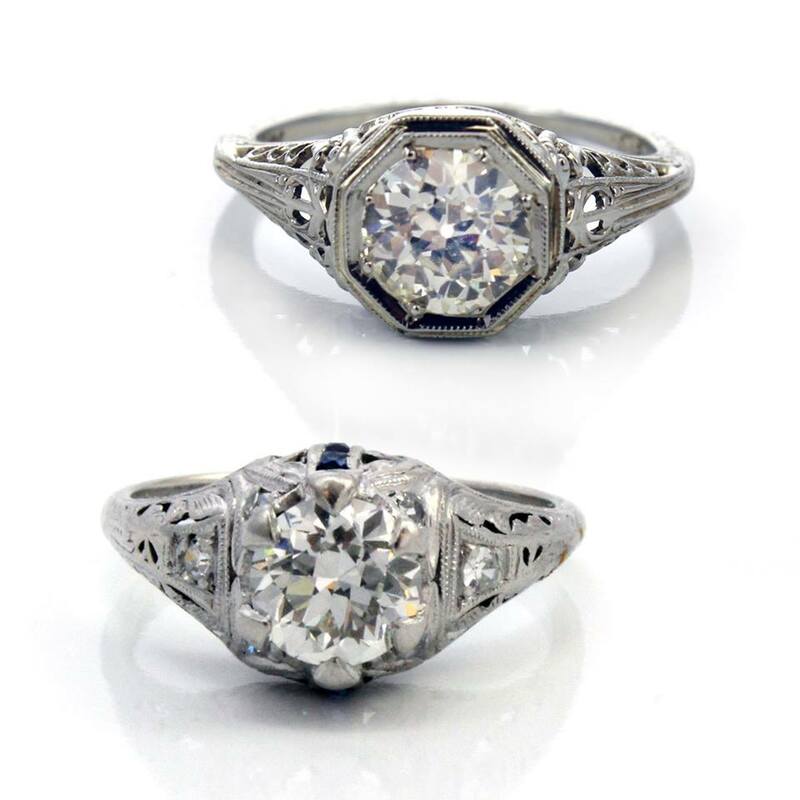 Buying vintage Art Deco engagement rings can be a twisted and confusing process, especially over the Internet. Educating yourself and your significant other about the rings from this era will help give you the confidence and peace of mind needed to make what can be a very daunting purchase. The Art Deco period took place in the early 1900’s during World War I, the Roaring Twenties, and the beginning of the Great Depression. Right around 1915 white gold became available on the commercial market. This is an important time marker because if you are looking at an antique ring that is white gold (not platinum), you know that it doesn’t predate 1910-1920. 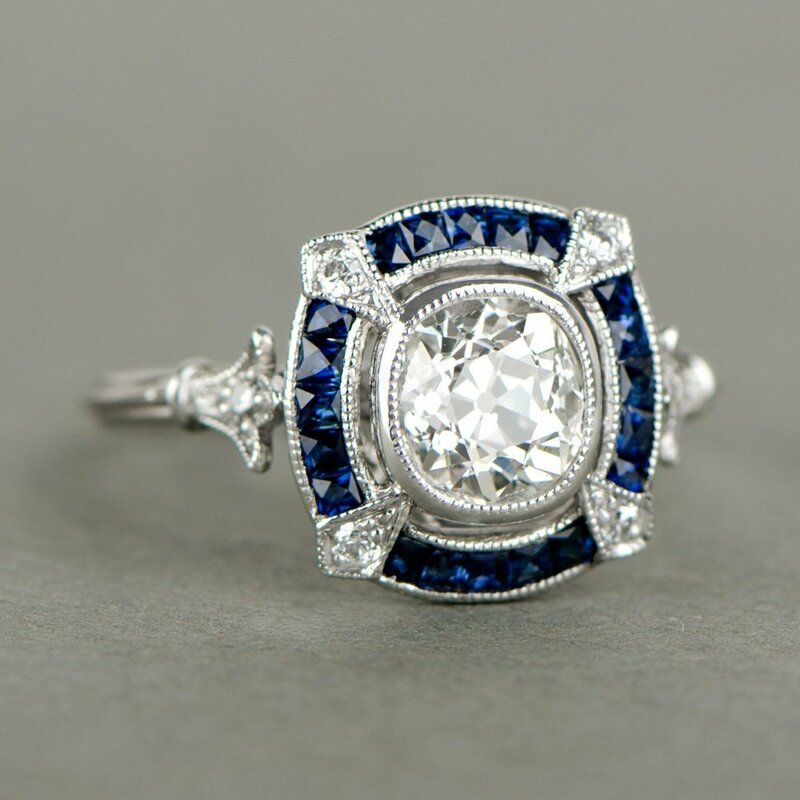 This period is the first era to truly embrace the engagement ring as we know it today, which is why we see more diamond rings from this period than we would the Edwardian or Belle Epoque periods. Likewise, diamond rings were available to the general population for the first time and could be ordered out of a catalog. While the economy was booming, so too was the jewelry industry, so each piece was finely crafted, oftentimes in Rhode Island or some other large jewelry manufacturing city. The filigree detailing implemented in the 1920’s and ’30s has become iconic and is nearly impossible to recreate with the same degree of crisp ingenuity today. Set a realistic budget with realistic expectations. You can get a quality heirloom anywhere from $200 – $15,000 depending on what you can afford and what suits your taste. Decide whether you want to buy locally or on the internet. Internet purchasing is difficult because you can’t technically try on a ring, but the advantages are you usually save on sales tax and costs are generally less due to less overhead. Research different vendors. Start book marking different shops and reading their feedback or yelp reviews. You want to be sure whoever you are going to purchase from has a good reputation with good terms of sale. The vendor is the one who is going to be able to authenticate your heirloom! It is important to feel confident you are getting what they say they are selling. Pinterest! A great way to narrow down a particular style of filigree or art deco ring is to make a pinterest board. Seeing them all side by side will help you narrow down your options. After you research variances between cost and quality, given you have some knowledge on diamond grading and values, you are ready to treat yourself or the one you love to a beautiful piece of history. Common Diamond Cuts: Round Brilliant, Round Transitional, Old European Cut.